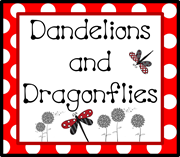 This post is for me as well as for the students. I am so tired of the same things, I decided to do some research to add some “spice” in my lunch! Of course, I want to be healthier, hence, healthy school lunch alternatives. As a teacher I have a microwave available to me. Students do not normally have one available. 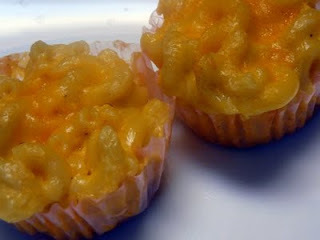 I will try to keep these healthy school lunch alternatives ideas non-microwavable. Let me know how your lunches come out! Keep in mind, you probably want your children to do well in school and to be happy. Having the coolest lunch at the table will certainly make them the coolest. 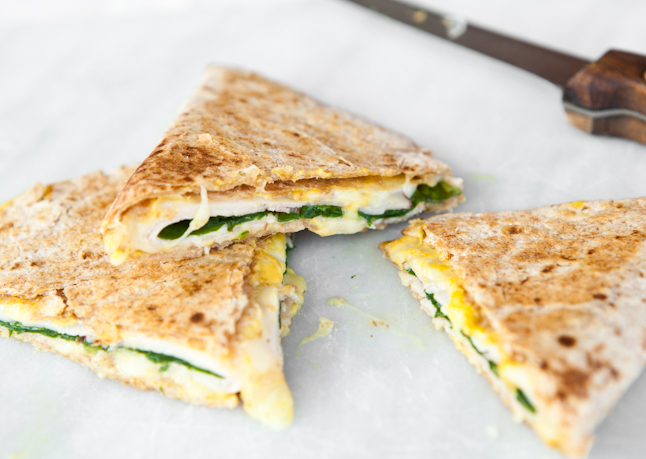 Kidding aside, these healthy school lunch alternatives will hopefully be full of vitamin rich fruits and vegetables, shock full of proteins, and great tasting. 2. 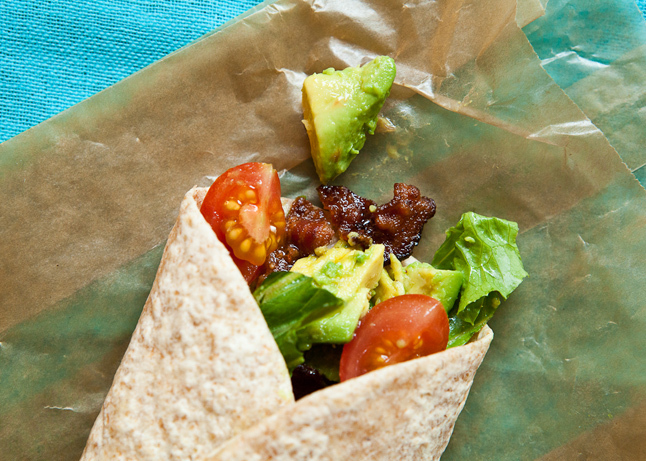 Bacon Lettuce Tomato Avocado Wrap BLTA Wrap – mix avocado with lime, spread on tortilla, place bacon, tomato chunks, some romaine lettuce, wrap, and enjoy. A great way to cook bacon to keep the fat content down- fold aluminum foil into 1″ accordion folds, place on baking sheet. Bake at 400 degrees until crisp. 3. Chips and Dip- Tortilla chips, with guacamole, salsa, sour cream. Each dip in its own small container. 4. Meatball Sandwich- Using a container that hold hot food, pack meatballs. Send in a little roll. 5. 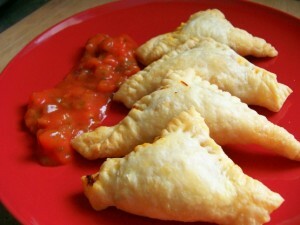 Ham and Cheese Quesidillas or any other lunch meat with cheese. 6. Pretzel Kabobs- Lunch meat, rolled up, and skewered with pretzel sticks. Kids will love these! 8. 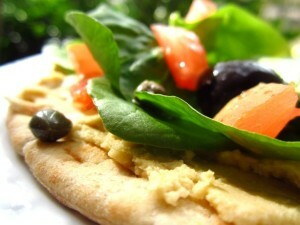 Hummus Pizza- Spread hummus over a pita and add fresh vegetables. Send the veggies in separately so your child can decorate the pizza themselves. 9. 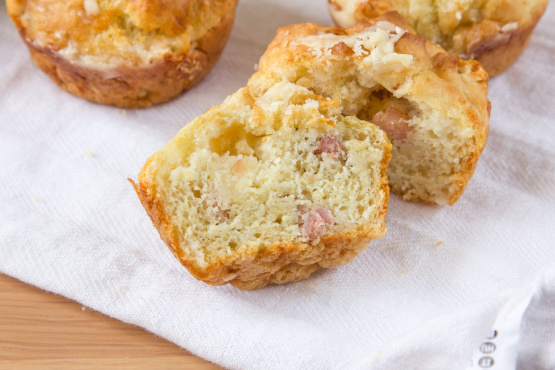 Ham and Cheese Muffins I guess you could put other lunch meats or cheeses for healthy lunch alternatives. How about vegetables, as well. 10. 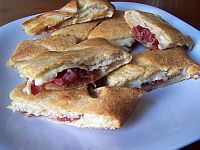 Deli Stromboli So easy, and freezable. 11. 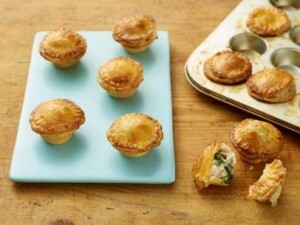 Mini Pot Pies Don’t they look delish! 14. 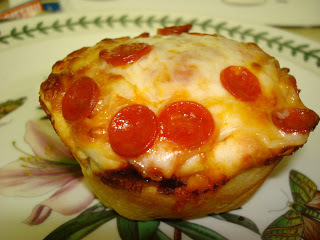 Meatloaf in a Cupcake Tin- make your favorite meatloaf recipe, but pack the meatloaf in cupcake pans to bake. 16. Walking Tacos Love This!!!!!!!!!!!!!!!!!! School. Picnics. Picnic Dinners in the Living Room! Yesssssssss!!! 17. Peanut Butter and Jelly on a Stick- Make a sandwich. Cut into squares. Put a square on a skewer, separated by a piece of fruit, etc. Could be any sandwich. I can see that many of you are thinking ahead already. Yes, you make the dishes, freeze them, then just heat up to pack in the lunch box. These healthy lunch alternatives could be a great time saver, yet, the children and teachers are happy. Please share any ideas you have tried. Teaching in elementary school has its unique circumstances. The children are very young and are leaning how to make choices. Many of those choices are for immediate gratification, especially involving food. Parents are very concerned about their progress in school, but don’t always see a link between what they eat and how they perform. Teachers are concerned that the students are attending to the lessons and making progress in understanding the content. 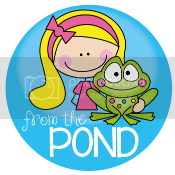 In several articles and podcasts from the Center for Disease Control, CDC, they say that academic achievement goes hand in hand with health. Not only eating healthy, but healthy physical activity. In NJ there is a state law that mandates 150 minutes of PE, or physical activity each week. Including PE, the bulk of that time comes from classroom time. Recess, unstructured activity, is a big part of our routine. We cover the physical element of health. Healthy eating is primarily on the shoulders of the parents. School lunches are available and try to work towards healthy lunches. Why is eating healthy so important? As cars need gas to move, we need food for our bodies to function properly. Eating the right foods allows our bodies to grow perform better. Eating healthy snacks instead of foods that are rich in sugar and fat inhibit our bodies from health. Healthy snacks can also help you perform better in school. Children need to be able to concentrate on the learning. If they eat foods that are high in carbohydrates for breakfast, their bodies have begun to digest these foods, leaving the children hungry and unable to focus by the time they get to school. If we can learn how to eat properly, food will stay in their bodies longer, fueling them to focusing and health. What Food is Good for My Body? According to research done by Women’s and Children’s Health Network, our bodies need to have protein, carbohydrates, fat, vitamins, minerals and water, for it to function properly. Proteins are important because it helps build your muscles, organs and glands. When you get hurt, it helps heal, as well. You can get proteins from eating meats, nuts, eggs, dairy products, including many plants. Carbohydrates are sugars and starches. They give us energy for us to use as we move and grow. The carbohydrates are usually the sweets we eat. 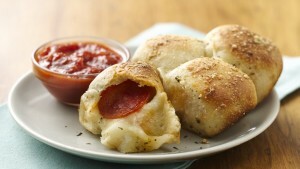 We need them, but if we have too much, then the carbohydrates make fat. We find carbohydrates in breads, pasta, fruits, potatoes and carrots. Although fat is also something our bodies need, too much of it is not healthy. Fats help our body store energy to use later. Carbohydrates are used for now, but when the carbohydrates are used up, our bodies turn to the fat in our bodies for energy. Fat protects our organs in our bodies, helps keep our blood pressure steady, helps keep skin and hair healthy, and gives vitamins a place to stay in our bodies. We get fat from meats, cheese, eggs, and many other healthy foods. The problem with fat is that it is also in some of the unhealthy stuff we eat- potato chips, fried food, and biscuits. Vitamins are found in almost all natural foods- grown from the earth. Our bodies need vitamins to help all of our organs function properly. Minerals accompany vitamins in natural foods. Water is an essential part of our diets. Water helps all parts of our bodies work. When we don’t have enough water, we get sick. The following healthy snacks are listed so you know what our bodies need. Balance is the key word when snacking. Too much is not good, neither is too little. Eating 3 meals a day gives your body the essential needs for your body. Healthy snacks just help us fuel up between meals. I would like to suggest some healthy snacks that could substitute some of the more calorie-laden, fatty, and unhealthy carbohydrate foods. Cucumber sandwiches- slice the cucumber length wise; place lunch meat on slice and roll up- like pinwheel sandwiches. Cottage cheese with fruit- canned pineapple, pears, peaches, etc. Lettuce wraps- use lettuce as the bread and roll up meat, cheese, etc. Tortilla Pizzas- Place nachos on baking sheet, layer salsa and shredded cheddar on the nachos, and bake until cheese melts. 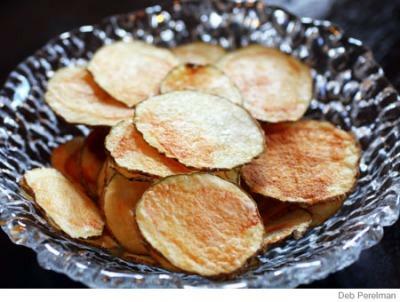 Homemade potato chips- paper thin slices of potato, sea salt, layered on parchment paper, microwave for 5-6 min. Experiment with zucchini, squash, or carrots. 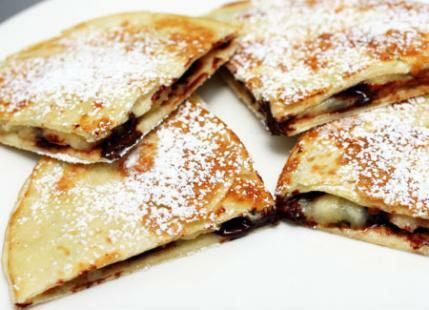 Chocolate Banana Crepes- on flour tortillas, arrange banana slices and smash lightly, sprinkle chocolate chips over bananas, fry in pan with butter, sprinkle with powdered sugar and cut into fourths. 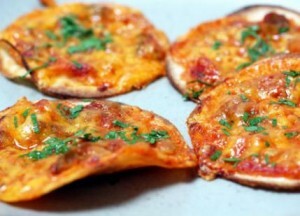 Tortillas- brush with melted butter, sprinkle cinnamon and sugar mixture on top, bake for 8-10 min. 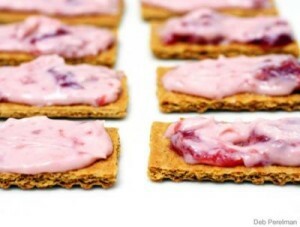 Cut into fourths, use these sugary chips to dip into yogurt, mixed fruit salad, or anything else you want. 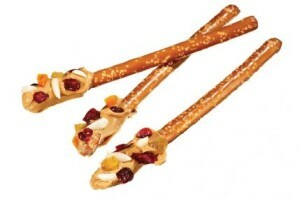 Pretzel Dips- Pretzel rods dipped into peanut butter and then rolled into crushed nuts, granola, or yogurt. You could just use the yogurt instead of peanut butter. 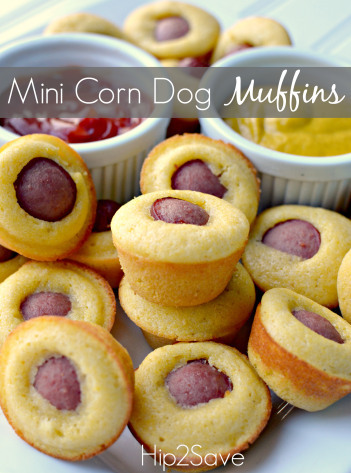 Parenting.com– many healthy snack ideas from above came from this web site. 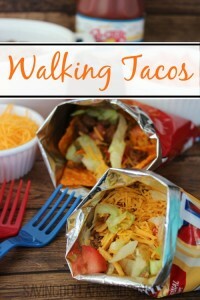 I hope we can share a whole lot more recipes for healthy snacks. Add a comment- what are your healthy snacks?